Been having a little fun with photoshop, have they? Nice way to instill confidence in your mail order customers. Browse through their catalog or website, and you'll see a lot of clearly faked images. Just lovely. J&P has been added to my list of companies to NEVER order from. I love these flowers -- like little streamers of crape paper celebrating the incoming season! 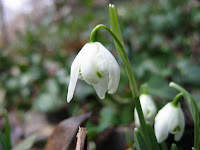 Snowdrops are such a joy, though I wish they were a bit... rowdier. 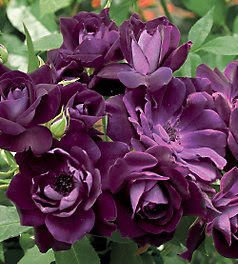 They're so elegant and understated, which is all well and good in the summer and fall, but right now I want COLOR! Because it was cloudy, they kept their flowers closed, but even so, they are such a cheery shade of yellow. This fall I am going to have to order several hundred of them and plant them in my yard. Sneak into parks and plant them after dark. Give them to the neighbors. 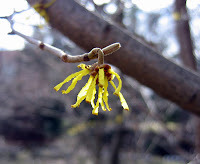 Because in March, in Michigan what we need is bright yellow flowers EVERYWHERE! It has been warm here (almost 60 degrees today! 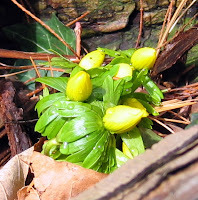 ), the days are getting longer, and the air smells like, well, like SPRING IS COMING! Which means I'm full of pent up gardening energy even though it is far too early to actually be out working in the garden. Thank goodness I have all those seeds I ordered to sow. Otherwise I'd probably start browsing catalogs again and find more plants I can't live without and can't afford. So I've been starting seeds. Growing your own seedlings for the garden isn't hard, but there is one key feature that a lot of people get wrong: Light. Seedlings need light -- LOTS of it. Too little light causes seedlings to grow long, spindly, and weak – light is what they use to make food, remember. Anorexic seedlings will limp along and the completely collapse when you plant them out into the garden. If you just focus on giving them lots of light, most of the difficulties of seed starting vanish. 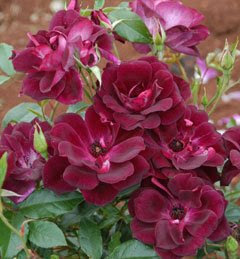 This is a great, low cost way if you are just starting a few tomatoes or flowers. The secret is to use the brightest bulbs you can and keep the bulbs as close to the plants as possible. Aim to keep the lights on 16 hours a day -- either turn them on and off when you get up and go to bed, or (if you are forgetful like me) get an inexpensive timer to plug them into. Be sure to use compact florescent bulbs -- traditional incandescent bulbs waste energy, get too hot, and produce a lot of a kind of light we can't see called far red, which causes plants to stretch and get spindly rather than stay nice and compact. 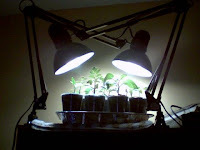 This is a step up from the desk lamps, and will allow you to start enough seedlings for a reasonable size gardens. Just be sure not to skimp on the light: for healthy seedlings, you want a minimum of four bulbs right next to each other – the cheapest and easiest way to get that is buy two standards shoplights with 2 bulbs each and hang them right next to each other. Then lower those lights so they almost touch the seedlings so they get as much list as possible. And just buy regular florescent bulbs, not those expensive "plant light" bulbs. Those bulbs are designed to emit light which will make your plants LOOK prettier, but they'll grow just as well under the cheaper, regular florescent bulbs. These are lights for serious seed starting -- or even for growing tropical plants year round like a mini greenhouse. They will set you back a few hundred dollars or so, but these lights actually produce amounts of light close to sunlight and will grow a lot of beautiful, compact, healthy seedling. Your neighbors may assume you are growing something illegal with it, but they'll change their tune when they see the lovely heirloom tomatoes you get to feast on all summer. But how much will it cost you to run all these lights? Less than you might think, and the exact amount is easy to calculate for the purposes of convincing skeptical spouses and partners. Your electric bill will have the amount they charge you per "kilowatt hour" -- 1 kilowatt hour is simply 1000 watts of electricity used in one hour. So, to calculate the cost to run your lights simply add up the wattage of the bulbs (for a four bulb, two shop light set up, about 160 watts) divide by 1000 (0.16) multiply by the 16 hours a day it will be on (0.16 x 16 = 2.56) and multiply that by what your electric company charges you per kilowatt hour. My company charges about 8 cents, so those lights would cost me about 20 cents a day to run. Even my 1000 watt high intensity discharge light only costs me about a $1.30 a day -- you can't even buy a cup of coffee for that, and you'll save a LOT more than that by not having to buy seedlings at the nursery. So invest in some lights, and get some tomatoes growing! For anything except the High Intesity Discharge lights, your best source will be your local home improvement store or hardware store. If you want to bring out the big guns, I recommend Home Harvest. They have tons of lights, and a lot of good information as well. I just got an e-mail from a nursery near Columbus Ohio (Bakers Acres -- if you live anywhere nearby, you've got to go check them out. 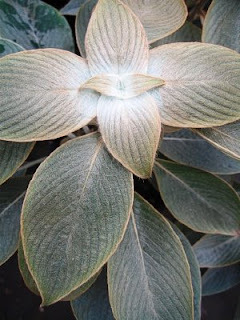 Coolest tender perennials out there) saying that they will have a "limited number" of Strobilanthes gossypinus for sale probably in late April. Let me make this clear: a nursery 4.5 hours away from me is going to have one plant I want for sale. What did I do when I got this e-mail? I turned to my calendar and wrote "Trip to Bakers Acres" in large letters over the last week in April. Yes, I really do plan my vacations around plants. I'd find that a little sad, only I'm too excited about getting Strobilanthes gossypinus!